affiliated with al Qaeda or (5) such other matters as the President considers appropriate. The President must submit the regulations and guidance to the appropriate committees of Congress no later than 60 days after enactment. It’s probably the single most extremist, tyrannical and dangerous bill introduced in the Senate in the last several decades, far beyond the horrific, habeas-abolishing Military Commissions Act. It literally empowers the President to imprison anyone he wants in his sole discretion by simply decreeing them a Terrorist suspect — including American citizens arrested on U.S. soil. The bill requires that all such individuals be placed in military custody, and explicitly says that they “may be detained without criminal charges and without trial for the duration of hostilities against the United States or its coalition partners,” which everyone expects to last decades, at least. 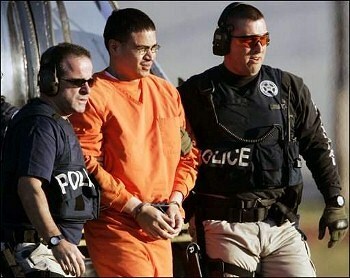 It’s basically a bill designed to formally authorize what the Bush administration did to American citizen Jose Padilla — arrest him on U.S. soil and imprison him for years in military custody with no charges. Well, sometimes mild-mannered commentary is just what the doctor ordered. This sounds every bit as bad as Glenn says it is. Basically, it reminds me of the Alien and Sedition Acts, which we’ve long since decided was not exactly a shining bright spot in our nation’s history. My hope is that the reason this bill has gotten so little attention is that no one thinks it has any chance of passage. Unfortunately, given the current mood of the country and the obvious angst of centrist Democrats about attacks on their terrorism-fighting credentials, that hardly seems plausible. Of course it has a chance of passage. This is well worth keeping an eye on.